Find My Workspace lists over 95% of the business centres market in Brierley Hill. Simply click Request Quote to check pricing for one office, or Add to Basket for multiple offices. A detached 46,000 sq. ft. modern purpose built five-storey centre with a difference. 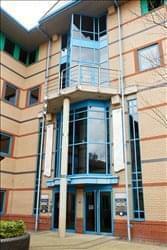 Recently been refurbished, office suites available from 100 Sq. ft. optional large open plan space which can be subdivided as per client requirements, flexi lease, ample car park parking, 24/7 access, disability access throughout, Kitchen facilities, manned reception, Male, Female and Disabled toilets on each floor, 2 x 8 person passenger lifts also serving every floor including basement which allows direct access from the underground car park. Extent of parking provision is subject to terms.